Now available: Kylix Developer's Guide by Charlie Calvert, Marjorie Calvert, John Kaster, Bob Swart, and David Intersimone. The CD contains Kylix 2 Open Edition and a bonus chapter "What's New in Kylix 2", introducing the so-called "Snap" technologies in Kylix 2 such as DataSnap, WebSnap and BizSnap - see John Kaster's example. I have written the entire "Web Server Application Development" part of this book, with a lot of focus on WebBroker. Three in-depth chapters about web server development with Kylix (using NetCLX, also known as WebBroker), namely: chapter 19 (Apache Web Server Applications), chapter 20 (Web Server Development), and chapter 21 (Advanced Web Server Development). Bonus: a chapter about Kylix 2 BizSnap written by me! I have written the entire "Web Server Application Development" part of this book, with a lot of focus on WebBroker. I could have written even more, and in fact one of the final examples was clipped from the book (because of the length of the text), and will be made available on this website shortly. Bonus: a chapter on Kylix 2 BizSnap written by me! 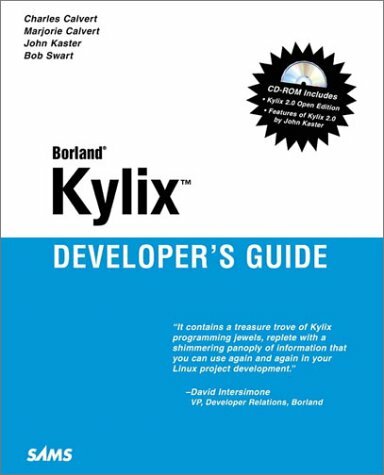 You can now order Kylix Developer's Guide from Amazon.com and Amazon.co.uk (with significant discounts). As you can see, I wrote chapters 19, 20 and 21 of the Kylix Developer's Guide (and I reviewed almost a dozen other chapters from the book).